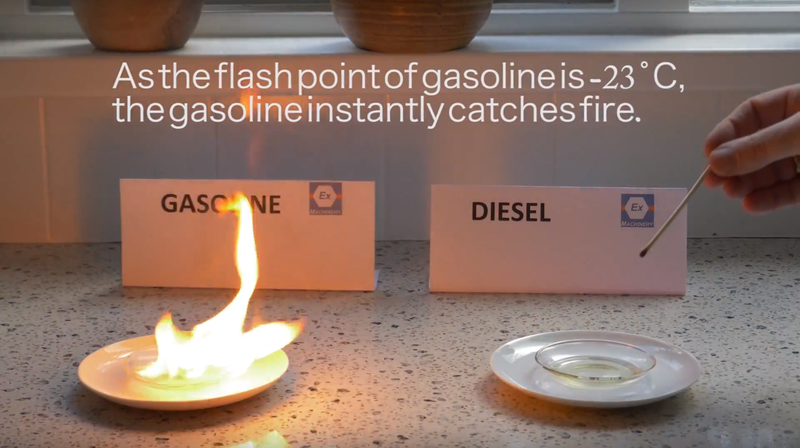 Watch in our video demonstration Flash point of gasoline and diesel how difficult it is to light a saucer of diesel with a match. ….and why lighting a bowl of gasoline is a complete different story. This blog is about the main characteristics of gas explosions, the huge risks and what equipment can be used safely. Also learn why the bowl filled with diesel eventually does catch fire. So, enjoy this educational blog and video but, … DO NOT TRY THIS AT HOME. In a gas explosion, gas is the fuel that mixed with air causes an explosion when ignited. Relatively little energy is needed to ignite gas. The consequences of gas explosions can be huge. The petrochemical industry face these risks on a daily bases and safety is their top priority. A dramatic accident at a rocket fuel plant in Nevada, USA in 2007, shows the devastating power of a gas explosion. Since the 1970s, there have been regulations regarding industrial locations where there are risks of gas explosions. Gas ignites, unlike dust explosions, at once. In a flat building the automatic switch on of a central heater unit in the basement was enough to cause an explosion. A simple spark from the switch ignited the vapour of solvent used by maintenance workers on the top floor. The solvent vapour, much heavier than oxygen moved downwards through the staircase and filled the heater room. This example, used in many educational settings, shows that even a little spark is enough. At this temperature, a combustible (explosive) mixture of vapour and air is created directly above a flammable liquid. In other words, only if the immediate environment of the liquid has the same temperature as the flash point, the liquid can be lit. It goes without saying that the risk of explosion decreases when the liquid temperature is kept below the flash point or the ambient temperature is kept lower than the liquid temperature. As said every type of liquid has a specific flash point. For example, diesel has a relatively high flash point of 55 ° C. In practice, this means that diesel hardly gives rise to an explosion hazard at outside temperatures. Diesel is clearly safer than petrol. Unlike diesel, gasoline has a very low flash point of -23 ° C. That is why under almost all conditions there is an explosive atmosphere directly above petrol. Another example: Ethyl acetate also has a low flash point: – 4 ° C. This means that this liquid is explosive at normal ambient temperatures. Ethyl acetate is therefore an explosion hazard. Of course there are also other properties of this fluid that potentially cause health hazards. All properties of liquids are found in the so-called safety data sheet, which are prepared by the manufacturer. A flash point is often confused with the ignition temperature. But it is something fundamentally different. When we talk about ignition temperature, we mean the temperature the liquid ignites, even without a flame or spark. When diesel fume only comes into contact with air of 210 °C , it burns. Now about the flash point: gasoline placed in an open bin has a flammable vapour above the surface when temperature of the liquid is – 23 °C. You can imagine a cloud of gasoline vapour hanging above the surface of the liquid. When a spark or flame hits the vapour, it ignites. A low flash point is more dangerous. Table 1. Various flash points, ignition temperature classes of different substances. The video shows a saucer of gasoline and a saucer of diesel. At standard indoor temperature we try to light both liquids with a burning match. As the flash point of gasoline is -23 ̊C, the gasoline instantly catches fire. Initially nothing happens to the diesel when we put our burning match in the liquid. Why? The temperature of the diesel needs to be heated up to 55 ̊C degrees by the match before the liquid starts burning. The tip of the burning match touching the liquid is about 1000 ̊C. It takes over a full minute before the diesel starts burning. To secure safety the surface temperature of an explosion proof device needs to be limited. The surface temperature may never exceed the ignition temperature of the flammable substance present. The temperature class indicates the limitation of the surface temperature your device is designed for. Table 2. Temperature classes T1 – T6 for explosion proof equipment. Ex-Machinery has specialized in ATEX and explosion safety for over 14 years. Are you interested in explosion-proof equipment? Then please do follow our ATEX specialist Gido van Tienhoven on LinkedIn and he will keep you updated on ATEX and explosion safety. 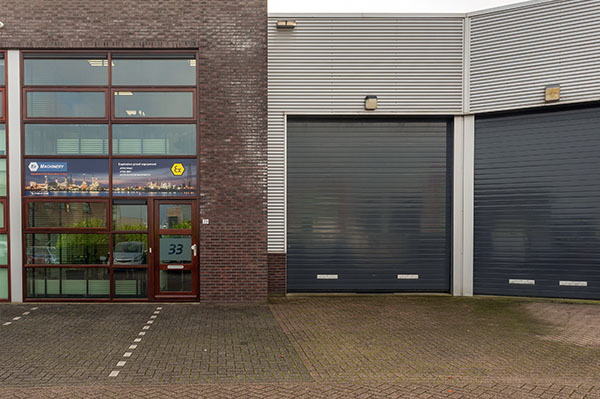 You can also send Gido your specific ATEX question at gt@ex-machinery.com. Please include your technical specifications. We are committed to working with you to help you find your ATEX solution. Please do also read our other blogs, which contain much interesting information on ATEX and explosion safety.